Femoro acetabular impingement syndrome case file is a typical patient. Femoro acetabular impingement syndrome case file gives a broader perspective on this condition which is so treatable, especially if caught in the early stages. The problem is that it's not usually detected until it is advanced, partly because it causes no or little pain, and secondly as many doctors, and a good number of chiropractors too have never heard of it. I hadn't either until five years ago. It's a new diagnosis of a condition not well understood; it was simply labelled hip arthritis, which is really quite rare in the young person. This is not arthritis, though it leads on to degenerative change if not addressed in time; your chiropractor is well placed to treat it, if he understands the condition. Mr S is a 55 year old man with a three year history of increasing groin pain and stiffness. For the last three months putting on his socks has been most difficult; he just can't flex the hip sufficiently now to reach his feet, yet he has minimal arthritis. FAIS is a pre-arthritic condition; stiffness in the hip and groin pain are the key signs. Do nothing and it slowly turns to concrete. Golf has become increasingly difficult and, when he first consulted me six weeks ago, he had to use an electric golf cart, and take two anti inflammatory drugs before playing nine holes. The xray above is of one of his hips. The other is very similar. Femoro acetabular impingement syndrome case file will make for interesting reading if you or your child have groin pain. It comes in two forms and usually they coexist in the so called mixed form. The spur on the rim of the hip socket is called the pincer. The other is a bump on the neck of the hip; it's known as a CAM deformity. Untreated in the young person it leads unerringly to the situation in this case file. The later it's diagnosed the more difficult the treatment and the worse the prognosis. Despite total hip replacement being a relatively successful operation today, it's a big procedure with a long general anaesthetic and a huge bill at the end of the day. Two of them is double the likelihood of serious difficulties. His orthopodic surgeon has declared that he has hip arthritis, and that he will have to have two hip replacements within 2 to 3 years; it was not yet bad enough. But bad enough that he woke in pain every time he turned in bed, and on the golf course he felt like an old man. True, he does have grade 1 cox arthritis duplex, but it's early. The real underlying complaint is femoro acetabular impingement syndrome. 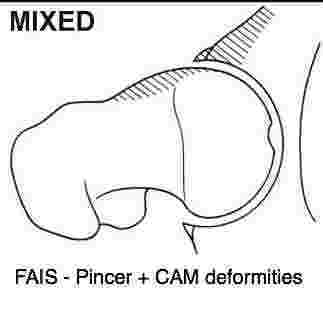 Femoro acetabular impingement syndrome case file comes in two forms; with pincer and cam deformities. The arrows clearly indicate that he has both the CAM and PINCER type of femoro acetabular impingement syndrome. What is noteworthy is that there is minimal hip degeneration. Slight loss of joint space but no erosions or cysts, no laying down of calcium in the roof of the acetabulum, and a nice smooth surface of the ball of the femur. But clinically, severe stiffness is a characteristic of every femoro acetabular impingement syndrome case file. Mr S could not flex his hips more than 90 degrees in the beginning, and the faber test was strongly restricted, as in external rotation and abduction; so too internal rotation and adduction. The diagnosis in my opinion was routine. After only four treatments he says he can feel meer ruimte, more space or room, in the hips when he does the exercises I gave him; he can put on his socks again and last weekend he played 9 holes, walking the whole distance, with no anti inflammatory medication. Admittedly, after he had swallowed a few painkilling pints at the nineteenth hole, and he still had marked difficulty getting off the stool, but the improvement lasted less than a day. Aachen and Cologne weren't built in a day, as we say in Holland. Sadly, he said after seven treatments over a four week period that the range of motion had improved and he could put is socks on but there was no significant reduction in the pain, so he was stopping with the treatment. His insurance pays for only seven treatments. In two years they will be paying for two total hip replacements, but 1000 euros per year for chiropractic was out of the question. Until we chiropractors can produce the research that we can maintain conditions like these, insurance schemes are not likely to pay. There are frequently not insignificant different expectations between the patient and your chiropractor. She is endeavoring to increase the range of motion in your joints but you want less pain. In the short term that mobilising of the joints may actually increase your pain especially if done too robustly. But my experience is that when the range of motion increases ultimately the pain will lessen. That applies just as much to a back as a frozen shoulder too. Movement of the joint gets the synovial fluid sloshing about in the joint; that's the stuff the feeds the hyaline cartilage. So, if the movement in your back, neck, shoulder, hip is improving, be patient. The pain will lessen. Here's one other factor; I was unable to convince Mr S to greatly increase the fatty fish in his diet for extra omega 3; he doesn't like fish. Nor would his wife start making a chicken bones bouillon regularly for him; they at only chicken filet. In difficult cases one has to tackle every angle of the treatment, and that includes the nutrition. This is an update at our femoro acetabular impingement syndrome case file; at that stage I didn't know that freshly ground flaxseeds were also rich in omega 3. They are inexpensive, but you cannot take them whole; like sesame seeds which are also loaded with lignins, they have to be ground. There are many other benefits from also eating the kernel; so avoid the oil capsules. In any event it goes rancid very quickly. It's this powerful anti inflammatory effect that makes them so beneficial, but they are oxidised simultaneously; go off. In his case he had a dried out look about him. Hard to describe, but I believe that physical appearance may have deeper significance. Greater hydration of the tissues is needed. Chiropractic help for FAIS is a reality; nothing including surgery will "cure" it; it's a condition that needs to be managed and maintained and can be very successfully done by your DC. Do you or your child have a stiff sore hip? The sooner the treatment begins the better. The treatment protocol that I have developed for a femoro acetabular impingement syndrome case file involves exercises done several times a day, mobilisation of the hip (by me), distraction of the hip, painful treatment of the groin muscles and adjustments of the sacroiliac joint. To be honest, it's not rocket science, just plain chiropractic applied specifically to the hip joint. 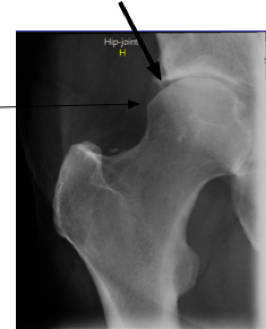 Hip exercises are a vital part of the protocol in the treatment of femoro acetabular impingement syndrome; see at this links for the home page on FAIS. 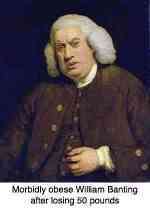 Oh yes, more about that chicken bones bouillon that has been researched to help with rheumy patients at Harvard. Chicken bones extract made into a soup, proven relief of arthritis. These ten short questions will give you and your chiropractor a more objective measure of how badly your hip pain is affecting your lifestyle, and whether the treatment is helping. Groin pain is the commonest complaint, in over 80 percent of femoro acetabular impingement syndrome case files; it's because that offending growth bumps against the anterior labrum causing cracks and tears. That means upper leg, thigh and groin pain. It happens in two ways. Firstly when internally rotating the flexed knee, the CAM growth comes up hard against that labrum. Or, when standing with the hip flexed, say squatting and turning the whole body outwards, it brings the labrum towards the growth; sporting people do this all the time. It's football season; just watch and see how many players in Brazil are injured in the groin during the World Cup. It's tragic having to tell a gifted person that if they go on with vigorous sport they will get early hip arthritis; but there is no alternative for a femoro acetabular impingement syndrome case file. Hip arthritis is so preventable. By far the majority of patients would fit into a short leg, dysplasia or femoro acetabular impingement syndrome case file. All of these are treatable if detected early. The cartilage in that hip will degenerate as the range of motion is reduced; it reduces the movement of the synovial fluid that nourishes the hyaline cartilage. In my book, folk with this condition must accept that have to exercise but it needs to be sports like swimming and cycling where gross rotation of the hip doesn't occur. Walking too. Perhaps surgeons have a better solution. There's nothing easy about the decisions that need to be made with femoro acetabular impingement syndrome case files. Recently a medical colleague reported that he had the offending CAM surgically shaved off, but it simply regrew and he wishes he'd never had it done. From FAIS case file to another page describing FEMORO ACETABULAR IMPINGEMENT SYNDROME Pincer in more detail. Groin and thigh pain home page. These are the links to nutritional support recommendations for anyone suffering from a generalised arthritic condition. In fact, it makes good sense to use them before we become arthritic.